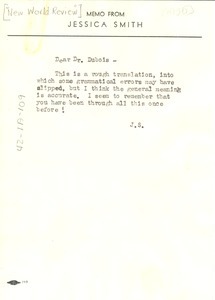 New York (N.Y.) - Signed Jessica Smith; enclosing a "rough translation" bearing some grammatical errors but purportedly conveying meaning accurately and seeming to recall that "you have been through all this once before!" 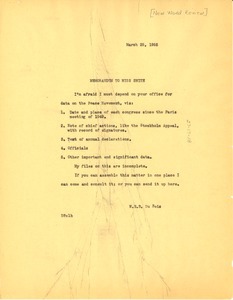 New York (N.Y.) - Addressed to Jessica Smith; for use in his forthcoming article on the world peace movement (see mums312-b144-i131 through i133), requesting that her office provide various facts and data thereon. 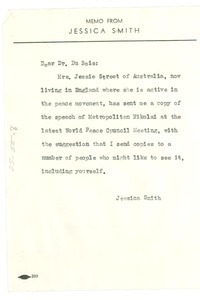 New York (N.Y.) - Signed Jessica Smith; inquiring if he'd like to be forwarded a copy of the Nikolai's speech at a recent World Peace Council meeting, as furnished by peace activist Jessie Street of Australia. 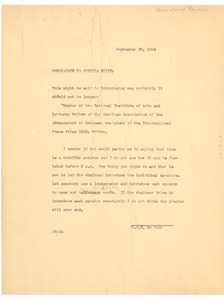 New York (N.Y.) - Addressed to Jessica Smith; deeming the Paul and Eslanda Robeson program enclosed (see mums312-b142-i322) "a terrible one" not likely to end until 2 a.m.; providing an introduction to his own 5-minute address thereat; and suggesting that "somebody use a loudspeaker and introduce each speaker by name and 2 dozen words." 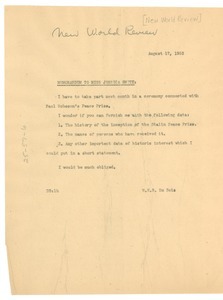 New York (N.Y.) - Addressed to Jessica Smith; in advance of his participation in the conferral of the Paul Robeson Peace Prize, seeking data on the origins, past recipients, and other historical data on the Stalin Peace Prize. See mums312-b140-i424 for answers. 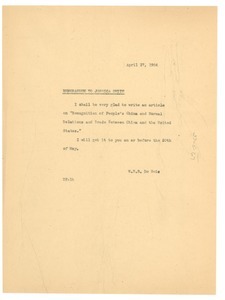 New York (N.Y.) - Addressed to Jessica Smith; gladly agreeing to provide the requested article (see mums312-b142-i315) on "Recognition of People's China and Normal Relations and Trade between China and the United States" and pledging to deliver same on or before 20th May.